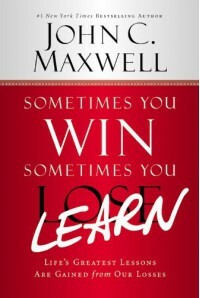 For a book about winning even while you are learning, there were a number of statements that John C. Maxwell used that I don't agree with. Why? Because they are statements of lack, the negative perspective and encouraging people that they don't have complete control of their life. We do. We create the good and the bad, if your perspective is that. Mine is that they are just events, events that happen based on our decisions and our desires. We need different events to occur to know what it is we do and don't like in our life. From there, you either learn or don't. Life was meant to be lived. Living means to make decisions and have a wide variety of events occurs in order to establish our preferences. You can't be grateful for all the good if you don't experience things that are on the contrary.